A shawl (from Persian: شال‎‎ shāl, which may be from Hindi: दुशाला duśālā, ultimately from Sanskrit: शाटी śāṭī) is a simple item of clothing, loosely worn over the shoulders, upper body and arms, and sometimes also over the head. It is usually a rectangular or square piece of cloth, that is often folded to make a triangle but can also be triangular in shape. Other shapes include oblong shawls. Shawl and pashmina name comes from Kashmir, but it originates from Hamedan Persia. Sources consider Cashmere crafts were introduced by Mir Sayyid Ali Hamadani In the 14th century Mir Ali Hamadani came to Ladakh, home land of pashmina goats where, for the first time in history he found that the Ladakhi kashmiri goats produced soft wool. He took someof this goat wool and made socks which he gave as a gift to king of Kashmir, Sultan Qutabdin. Afterwards Hamadani suggested to the king that they start a shawl weaving industry in Kashmir using this wool. That is how pashmina shawls began. The United national specialized agency UNESCO reported in 2014 that Ali Hamadani was one of the principal historical figures who shaped the culture of Kashmir, both architecturally and also through the flourishing of arts and crafts and hence economy in Kashmir. The skills and knowledge that he brought to Kashmir gave rise to an entire industry. Kashmir was a pivotal point through which the wealth, knowledge, and products of ancient India passed to the world. Perhaps the most widely known woven textiles are the famed Kashmir shawls. The Kanikar, for instance, has intricately woven designs that are formalized imitations of Nature. The Chenar leaf (plane tree leaf), apple and cherry blossoms, the rose and tulip, the almond and pear, the nightingale—these are done in deep mellow tones of maroon, dark red, gold yellow and browns. Yet another type of Kashmir shawl is the Jamiavr, which is a brocaded woolen fabric sometimes in pure wool and sometimes with a little cotton added. The floral design appears in a heavy, close embroidery-like weave in dull silk or soft pashmina (Persian, meaning "woolen"), and usually comprises small or large flowers delicately sprayed and combined; some shawls have net-like patterns with floral ensemble motifs in them. Still another type of Kashmir shawl is the double-sided Dourukha (Persian, meaning "having two faces"), a woven shawl that is so done as to produce the same effect on both sides. This is a unique piece of craftsmanship, in which a multi-coloured schematic pattern is woven all over the surface, and after the shawl is completed, the rafugar (expert embroiderer) works the outlines of the motifs in darker shades to bring into relief the beauty of design. This attractive mode of craftsmanship not only produces a shawl which is reversible because of the perfect workmanship on both sides, but it combines the crafts of both weaving and embroidery and religious beliefs expressed in different shawls. The most expensive shawls, called Shahtoosh, are made from under-fleece of the Tibetan antelope or Chiru. These shawls are so fine that even a very tightly woven shawl can be easily pulled through a small finger ring. The naksha, a Persian device like the Jacquard loom invented centuries later, enabled Indian weavers to create sinuous floral patterns and creeper designs in brocade to rival any painted by a brush. The Kashmir shawl that evolved from this expertise in its heyday had greater fame than any other Indian textile. Always a luxury commodity, the intricate, tapestry-woven, fine wool shawl had become a fashionable wrap for the ladies of the English and French elite by the 18th century. Suiupply fell short of demand and manufacturers pressed to produce more, created convincing embroidered versions of the woven shawls that could be produced in half the time. As early as 1803, Kashmiri needlework production was established to increase and hasten output of these shawls, which had been imitated in England since 1784 and even in France. By 1870, the advent of the Jacquard loom in Europe destroyed the exclusivity of the original Kashmir shawl, which began to be produced in Paisley, Scotland. Even the characteristic Kashmiri motif, the mango-shape, began to be known simply as the paisley. Somali women wearing traditional shawls. The paisley motif is so ubiquitous to Indian fabrics that it is hard to realize that it is only about 250 years old. It evolved from 1600's floral and tree-of-life designs that were created in expensive, tapestry-woven Mughal textiles. The design in India originated from Persian motif called butta-jeghgha which represents a stylized cypress tree, the symbol of Iranians. Early designs depicted single plants with large flowers and thin wavy stems, small leaves and roots. As the designs became denser over time, more flowers and leaves were compacted within the shape of the tree, or issuing from vases or a pair of leaves. By the late 18th century, the archetypal curved point at the top of an elliptical outline had evolved. The elaborate paisley created on Kashmir shawls became the vogue in Europe for over a century, and it was imitations of these shawls woven in factories at Paisley, Scotland, that gave it the name paisley still commonly used in the United States and Europe. In the late 18th century and 19th century, the paisley became an important motif in a wide range of Indian textiles, perhaps because it was associated with the Mughal court. It also caught the attention of poorer and non-Muslim Indians because it resembles a mango. "Rural Indians called an aam or mango a symbol of fertility". The first shawls, or "shals", were used in Assyrian times; later they went into widespread use in the Middle East. Shawls were also part of the traditional male costume in Kashmir. They were woven in extremely fine woollen twill, some such as the Orenburg shawl, were even said to be as fine as the Shatoosh. They could be in one colour only, woven in different colours (called tilikar), ornately woven or embroidered (called ameli). An Ethiopian woman in a traditional shawl. Kashmiri shawls were high-fashion garments in Western Europe in the early- to mid-19th century. Paisley shawls, imitation Kashmiri shawls woven in Paisley, Renfrewshire, are the origin of the name of the traditional paisley pattern. Shawls were also manufactured in the city of Norwich, Norfolk from the late 18th century (and some two decades before Paisley) until about the 1870s. Silk shawls with fringes, made in China, were available by the first decade of the 19th century. Ones with embroidery and fringes were available in Europe and the Americas by 1820. These were called China crêpe shawls or China shawls, and in Spain mantones de Manila because they were shipped to Spain from China via the port of Manila. The importance of these shawls in fashionable women's wardrobes declined between 1865 and 1870 in Western culture. However, they became part of folk dress in a number of places including Germany, the Near East, various parts of Latin America, and Spain where they became a part of Romani (gitana) dress especially in Andalusia and Madrid. These embroidered items were revived in the 1920s under the name of Spanish shawls. Their use as part of the costume of the lead in the opera Carmen contributed to the association of the shawls with Spain rather than China. Some cultures incorporate shawls of various types into their national folk dress, mainly because the relatively unstructured shawls were much more commonly used in earlier times. The wearing of shawls in early 19th-century France. Shawls are used in order to keep warm, to complement a costume, and for symbolic reasons. One famous type of shawl is the tallit, worn by Jewish men during prayers and ceremonies. Today, shawls are worn for added warmth (and fashion) at outdoor or indoor evening affairs, where the temperature is warm enough for men in suits but not for women in dresses and where a jacket might be inappropriate. Kashmir is India's northernmost state and was the point through which ancient India passed to the world. The Kashmir shawl that evolved from a local expertise had greater fame than any other Indian textile. Shawl weavers in Kashmir circa 1903. The majority of the woollen fabrics of Kashmir, and particularly the best quality shawls, were and are still made of Pashm or Pashmina, which is the wool of Capra hircus, a species of the wild Asian mountain goat. Hence the shawls came to be called Pashmina. The fine fleece used for the shawls is that which grows under the rough, woolly, outer coat of the animal; that from the under-belly, which is shed on the approach of hot weather. Materials of an inferior grade were of the wool of the wild Himalayan mountain sheep or the Himalayan Ibex. However, the best fleece wool is soft, silky and warm is of the wild goats, and painstakingly gathered from shrubs and rough rocks against which the animals rub off their fleece on the approach of summer. This was undoubtedly the soft fleece wool from which were made the famous and much coveted 'ring shawls' in Mughal times. Unfortunately very inferior and second rate wool taken from domesticated sheep and goats provide most of the wool used today on the looms of Kashmir. The needle-worked Amlikar or Amli, made from Pashmina wool is a shawl embroidered almost all over with the needle on a plain woven ground. The colours most commonly seen on pashmina shawls are yellow, white, black, blue, green, purple, crimson and scarlet. The design motifs are usually formalised imitations of nature like the leaf, flower and tree designs mentioned above; they are always done in rich colours. The embroidery stitch employed is rather like the parallel darning stitch and is rarely allowed to penetrate the entire fabric. The outlines of the design are further touched up and emphasized with silk or woollen thread of different colours run round the finer details; the stitch used for this is at an angle overlapping darn stitch, all the stitches used are so minute and fine that individually they can be seen with the unaided eye only with difficulty. When Pashmina wool is used for the embroidery work, it is made to blend so intimately with the texture of the basic shawl material that it would be difficult to insert even a fine needle between the embroidery stitches and the basic fabric. The Emperor Akbar was a great admirer of the shawls of Kashmir. It was he who began the fashion of wearing them in duplicate, sewn back to back, so that the under surfaces of the shawls were never seen. During that time the most desired shawls were those worked in gold and silver thread or shawls with border ornamented with fringes of gold, silver and silk thread. The Do-shala, as the name designates ("two-shawl"), are always sold in pairs, there being many varieties of them. In the Khali-matan the central field is quite plain and without any ornamentation. The Char-bagan is made up of four pieces in different colours neatly joined together; the central fluid of the shawl is embellished with a medallion of flowers. However, when the field is ornamented with flowers in the four corners we have the Kunj. Perhaps the most characteristic of the Kashmir shawls is the one made like patchwork. The patterns are woven on the looms in long strips, about twelve to eighteen inches in length and from one half to two inches in width. These design strips, made on very simple and primitive looms, are then cut to the required lengths and very neatly and expertly hand sewn together with almost invisible stitches and finally joined by sewing to a plain central field piece. As a variation, pieces may be separately woven, cut up in various shapes of differing sizes and expertly sewn together and then further elaborated with embroidery. But there is a difference between these two types: while the patchwork loom shawls are made up from separate narrow strips, the patchwork embroidered shawls consists of a certain number of irregularly shaped pieces joined together, each one balancing the predominant colour scheme of the shawl. The basic material for a gubba is milled blanket dyed in plain colour. Embroidery is bold and vivid in designing and done with woollen or cotton threads. Gubbas have more of a folk flavour blankets cut and patched into geometric patterns, with limited, embroidery on joining and open space. It is more like appliqué work. Colours are bright and attractive. They are cheap and used for dewan covering or as floor covering—namdas. 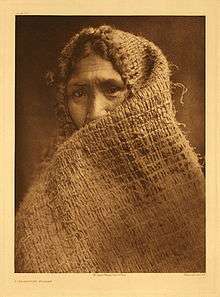 Hesquiat woman wrapped in a shawl. Triangular knit lace shawls are usually knitted from the neck down, and may or may not be shaped. In contrast, Faroese lace shawls are knitted bottom up and contain a centre back gusset. Each shawl consists of two triangular side panels, a trapezoid-shaped back gusset, an edge treatment, and usually also shoulder shaping. Wikimedia Commons has media related to shawls. ↑ "Shawl". Online Etymology Dictionary. ↑ Bhatnagar 2005, p. .
↑ Bhatnagar 2005, p. 43. ↑ Bhatnagar 2005, pp. 42–56. 1 2 Bhatnagar 2004, pp. 30–34. ↑ Ancient Egyptian, Assyrian, and Persian costumes and decorations, p.41. ↑ Chisholm 1911, p. 814. Bhatnagar, Parul (2004). Traditional Indian costumes & textiless. Chandigarh: abhishek. pp. 30–34, 95. ISBN 81-8247-002-1. This article incorporates text from a publication now in the public domain: Chisholm, Hugh, ed. (1911). "Shawl". Encyclopædia Britannica. 24 (11th ed.). Cambridge University Press. p. 814. Irwin, John (1973). The Kashmir Shawl. London: HMSO. Worth, Susannah (December 1995). "Early 20th Century Embroidered Shawls". Needle Arts. 26 (4): 38–41. Worth, Susannah (1986). "Embroidered China Crepe Shawls: 1800-1870". Dress. 12: 43–51.